When printing a document, do you get the colors you expect or find yourself surprised by the results? If you get surprises – chances are that you aren’t using Color Profiles correctly. If you are puzzled by terms like Color Profile, Rendering Intent, Color Space and Color Gamut; then this program is for you. The focus will be to help you gain a solid understanding of what Color Management is, and how to put it to use in your workflow. The emphasis will be on learning the terminology and concepts, that enable a user to benefit from being Color Managed. In addition, the effort will be to approach the topic in a non-technical and more visual way. Special Raffle Event: One free display calibration; a $75 value for an iMac or MacBook. Raffle tickets will be sold ahead of time and the winner notified by email so they can bring their computer to the meeting. Use this link to buy raffle tickets with PayPal. Click this link to buy raffle tickets with Paypal. Special Display Calibration Raffle. Alex Lippisch is a veteran commercial photographer who began working digitally in 2001. As time went by he found himself unable to get predictable color in images, as they passed from screen to print. Thus he spent many a long hour reading about and learning the process of being color managed. Now he teaches and consults others how to do it, at the University of Akron and independently. 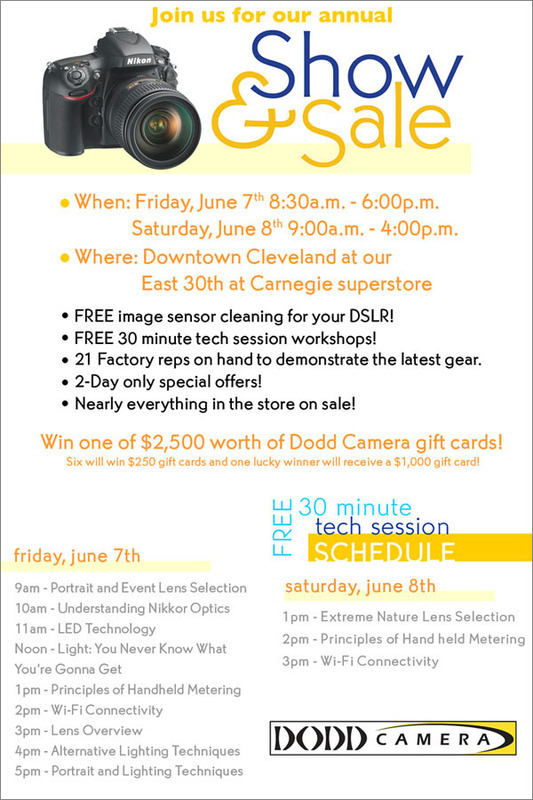 The Dodd Camera Annual Spring Show & Sale will be June 7th and 8th at our downtown Cleveland location at East 30th and Carnegie. Nearly everything in the store will be on sale! Dodd Camera will be offering a free sensor cleaning (limit one per customer), that’s normally a $100 service for free! Plus, we will be raffling off $2500 in gift cards, including a $1000 grand prize gift card! 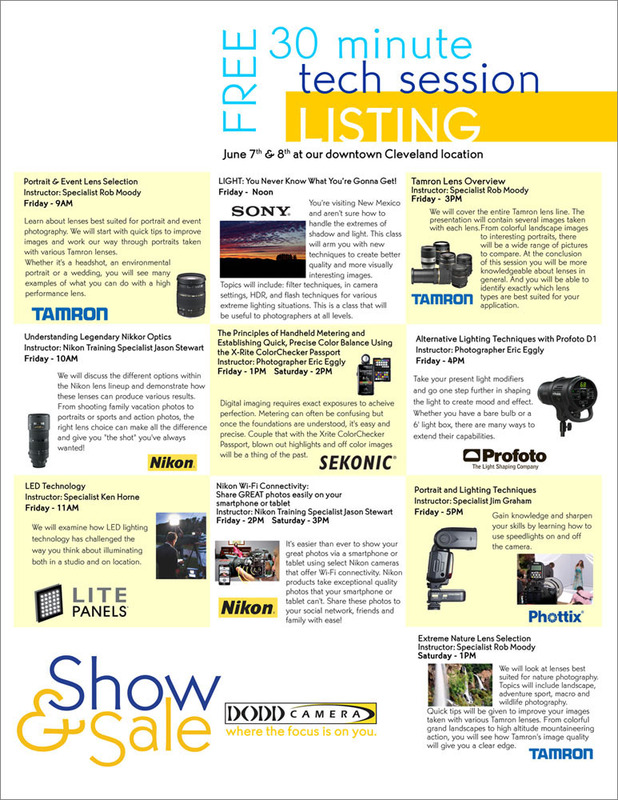 If that’s not enough reason to come down, we will have representatives from Nikon, Canon, Sony, Fuji, Tamron, Sigma and more in store, 30-minute tech sessions, and a Nikon Speedlight workshop!